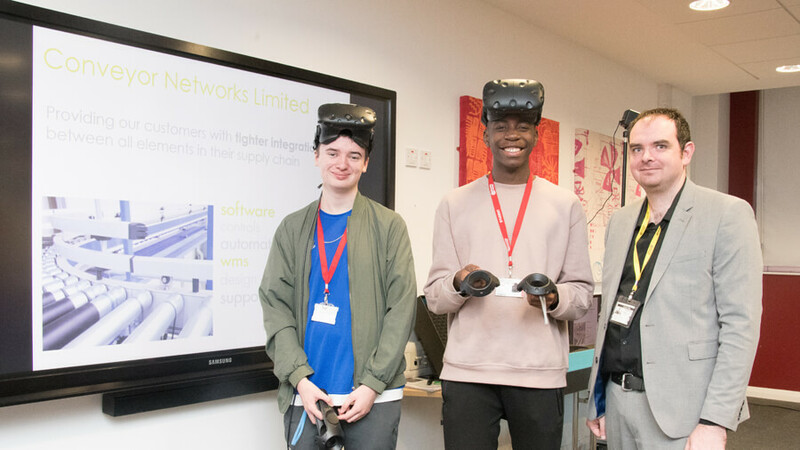 [L-R] Business students, Kai Barrett and Nigel Moyo, with Chris Roberts from Conveyor Networks Ltd.
Our Business students got to experience virtual reality when Chris Roberts from Conveyor Networks Ltd paid us a visit. Chris, Technical Sales Manager at Conveyor Networks Ltd, spoke about the warehouse automation and software solutions they provide for retail and eCommerce businesses. He explained how warehousing companies use virtual reality and automation to simulate their own businesses, allowing them to trial new systems and processes before it is introduced to the business in reality, before allowing students to have a go of the state-of-the-art equipment. Daresbury-based Conveyor Networks Ltd is a systems integrator and solutions provider founded in 2009. Working from design and build through to servicing and maintenance, it offers retail and eCommerce businesses of all sizes, best-in-class warehouse software and automation solutions. It engineers imio software, its own modular warehouse management system and can run everything from conveyors and sortation to packing lines, fully automated processes and carrier integration. Visit www.conveyornetworks.co.uk for more information.